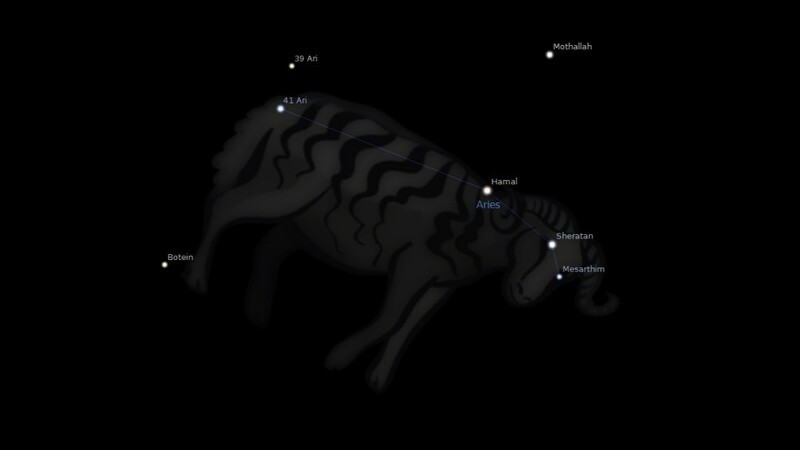 Constellation Aries the Ram, is an ecliptic constellation laying between constellation Pisces and constellation Taurus. A small constellation, it spans only 20 degrees longitude in the zodiac sign Taurus. 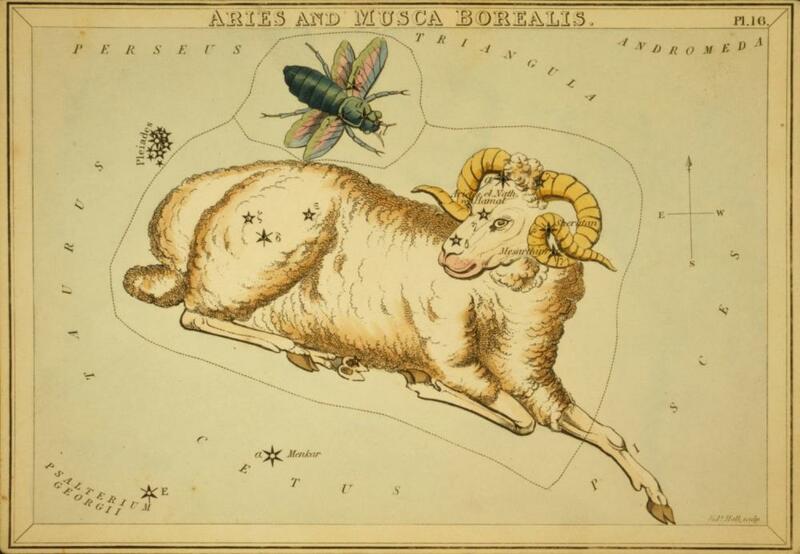 The Aries constellation contains five named fixed stars. Aries represents the ram with the golden fleece, a gift from Mercury, upon which Phrixus and his sister Helle escaped through the air from their step-mother Ino. On arriving in Colchis, Phrixus sacrificed the ram to Jupiter and its fleece was hung in the Grove of Mars, whence it was subsequently carried away by Jason (see Argo). According to another account it was the ram that guided Bacchus to a spring of water in the Libyan desert. Of all the animals to be seen prancing on our Easter Cards, the lamb is surely that one most popular, though, of course, many other animals also have young at this time, the root of the lamb’s popularity is astrological. Aries is just as much a lamb as a ram. The astrological theme is seen in religion too. Christian litany is full of references to Jesus as The Lamb (of God), and the foundation of Christianity is commonly said to have coincided with the start of the ‘Piscean Age’, when the cusp Aries, the Sign, moved out of the Constellation into its preceding neighbor Pisces…This did not happen until the year 217 A.D., but then the new religion likewise took three hundred years to become established, in 325 A.D.. So the coincidence of the two can be said to be accurate enough. Other commentators have seen the astrological significance in the story of the near-sacrifice of Isaac by the patriarch Abraham, which ended with the father being directed instead to sacrifice a ram Divinely caught in a nearby thicket. Isaac had a half-brother, Ishmail, so the story is reminiscent of the many myths of one of two brothers being sacrificed for the benefit of the other: Cain & Abel, Castor & Pollux, and so-on. The suggestion here is that the Isaac incident marks the end f the Gemini era of ‘twin sacrifice’, the shifting of the Vernal Equinox into Taurus, the Constellation and Sign most associates with the culture that began with Abraham, and a looking forward to the Aries era yet to come, when the culture which the patriarch was just initiating would burst forth to conquer all around it, remembering as we should how Aries is considered ruled by Mars the planet of war and conquest. We may also note that the name Abraham or Abrahm, means ‘Servant of the Divinity’ or, in its form Ibrahim, ‘Servant of the Merciful One’, in the culture which derives its descent through Ishmail especially. Among astrologers Aries was a dreaded sign indicating passionate temper and bodily hurt, and thus it fitly formed the House of Mars, although some attributed guardianship over it to Pallas Minerva, daughter of Jove whom Aries represented. It was supposed to hold sway over the head and face; in fact the Egyptians called it Arnum, the Lord of the Head; while, geographically, it ruled Denmark, England, France, Germany, Lesser Poland and Switzerland, Syria, Capua, Naples and Verona, with white and red as its colors. In the time of Manilius it was naturally thought of as ruling the Hellespont and Propontis, Egypt and the Nile, Persia and Syria; and, with Leo and Sagittarius, was the Fiery Trigon. “The Ram, who is rich with an abundance of fleecy wool and, when shorn of this, with a fresh supply, will ever cherish hopes; he will rise from the sudden shipwreck of his affairs to abundant wealth only to meet with a fall, and his desires will lead him to disaster; he will yield his produce for the common benefit, the fleece which by a thousand crafts gives birth to different forms of gain, now workers pile into heaps the undressed wool, now card it, now draw it into a tenuous thread, now weave the threads to form webs, and now they buy and sell for gain garments of every kind; no nation could dispense with these, even without indulgence in luxury. So important is this work that Pallas herself has claimed it for her own hands, of which she has judged it worthy, and deems her victory over Arachne a token of her greatness. These are the callings and allied crafts that the Ram will decree for those born under his sign: in an anxious breast he will fashion a diffident heart that ever yearns to commend itself by its own praise. This is pictured by a ram, or lamb, full of vigour and life; not falling in death as CAPRICORNUS is. In the Denderah Zodiac its name is Tametouris Ammon, which means the reign, dominion, or government of Ammon. The lamb’s head is without horns, and is crowned with a circle. The Hebrew name is Taleh, the lamb. The Arabic name is Al Hamal, the sheep, gentle, merciful. This name has been mistakenly given by some to the principal star, α. The Syriac name is Amroo, as in the Syriac New Testament in John 1:29 “Behold the Lamb of God which taketh away the sin of the world.” The ancient Akkadian name was Bara-ziggar. Bar means altar, or sacrifice; and ziggar means right making; so that the full name would be the sacrifice of righteousness. 1. Fixed Stars and Constellations in Astrology, Vivian E. Robson, 1923, p.31. 2. The Living Stars, Dr. Eric Morse, 1988, p.31-33. 3. Star Names: Their Lore and Meaning, Richard H. Allen, 1889, p.79. 4. Astronomica, Manilius, 1st century AD, book 4, p.233. 5. The Witness of the Stars, E. W. Bullinger, 24. Aries (the Ram). A great article Jamie , thank you . You’re guys not just helping others locally but Worldly . So , you’re top of the pyramid , the eye . For others : Jesus Christ ??? He must’ve been the sun with 12 constellations , adorned by 3 huge stars such as Sirus etc . Same us ‘ Horus ‘ in 3000bc , born on 25th from a virgin with 12 disciples , baptized at 30 ,adorned as well .